Kakinomoto no Hitomaro (柿本 人麻呂; c. 662 – 708 or 710 C.E. ), was a Japanese poet of the Nara period who featured prominently in the oldest extant Japanese poetry anthology, Man'yōshū (Collection of Myriad Leaves), particularly in Volumes One and Two. He has been venerated by the Japanese since earliest times, and was Japan's first great literary figure. Hitomaro lived and wrote poetry at a time when Japan was emerging from a pre-literate society into a literate and civilized one. He combined the qualities of primitive song with new rhetoric and structural techniques (some of which may have been adapted from Chinese poetry), and wrote about sophisticated new subjects and concerns with an attitude of seriousness and importance. He wrote in the two major Japanese poetic forms of his day, tanka (or mijikauta, 'short poems') and choka (or nagauta, 'long poems'). 2.1 "In the Sea of Ivy-Clothed Iwami"
2.2 "The Bay of Tsunu"
As an official poet to the court of three successive rulers, Hitomaro produced a large number of works for public or political occasions, such as elegies and poems of praise and celebration. He also wrote moving personal expressions of grief, sorrow, and love. All of his poems exhibited the quality of including the reader in even the most personal thoughts and feelings. His poetry is known for its sense of humanity and empathy with nature. Among Hitomaro’s outstanding works are his poem on the ruined capital at Omi; his celebration of Prince Karu's journey to the plains of Aki; two poems each on the death of his first wife and on parting from his second; his lament on the death of Prince Takechi; and his poem composed on finding the body of a man on the island of Samine. The most famous poems include "In the Sea of Ivy-Clothed Iwami," "The Bay of Tsunu" and "I Loved Her Like the Leaves". Hitomaro was Japan's first great literary figure. Very little is known about his life, but he is believed to have been born and reared near Nara. The Kakinomoto clan from which he derived was a noble clan of the middle class, and he was conferred with Ason, the third highest of eight ranks. The clan had traditionally served the court mainly by holding religious ceremonies which included singing and the recitation of poems, and was closely related to the Sarume clan, whose legendary founder was Ama-no-Uzume, the dancer goddess. Despite Hitomaro’s prominence as a poet, his name does not appear in Nihon Shoki nor in Shoku Nihongi ("History of Japan II"). All the information about his life comes from his poems in the Manyoshu. Hitomaro was a middle-ranking courtier in Yamato and served as court poet to at least three sovereigns, Emperor Temmu (r. 673-686), Empress Jitô (690-697) and Emperor Mommu (697-707), at the end of the Asuka period (550-710 C.E.). Many of his most famous poems, such as Lament for Prince Takechi, were written for imperial occasions. Hitomaro lived and wrote poetry at a time when Japan was emerging from a pre-literate society into a literate and civilized one. 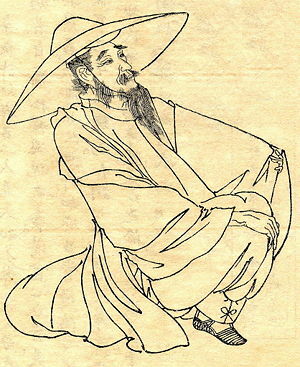 He took the raw, emotional qualities, plain imagery, and stiff technique of primitive song, incorporated new rhetoric and structural techniques (some of which may have been adapted from Chinese poetry), and wrote about new subjects and concerns with an attitude of seriousness and importance. The longer poems often begin with a solemn introduction, relating the present with the divine past of the Japanese land and people. Hitomaro wrote in the two major Japanese poetic forms of his day, tanka (or mijikauta, "short poems") and choka (or nagauta, "long poems"). It is thought that he also created sedoka (“head-repeated poem,” consisting of two three-line verses of 5, 7, 7 syllables), a relatively minor song form that seems to have barely survived him. Around 474 poems attributed to Hitomaro are found in the Man'yo-shu, the earliest and largest of Japan's anthologies of native poetry. Scholars agree with certainty that nineteen of the chōka and seventy-five or so tanka in the Man'yōshū were authored by Hitomaro; another opinion counts sixteen chōka and sixty-one tanka. The Hitomaro Kashû ('Hitomaro Collection') contains several hundred poems attributed to him, at least some of which are believed to be spurious. During the Heian period, some anonymous waka in the ''Manyoshu'' were attributed to Hitomaro. These include the waka attributed to Hitomaro in Fujiwara no Teika's compilation of the Hyakunin Isshu. Many of Hitomaro’s poems were written for public occasions, such as "Lament for Prince Takechi." Other poems were written on occasions in his life when he was particularly moved: parting from his wife, mourning for his wife, or finding the body of a man on the island of Samine. Even the works expressing his most private thoughts and feelings are completely accessible to the reader. Hitomaro wrote with a sense of shared humanity, inviting the world to participate with him in the scenes he was describing. He made masterful use of makura kotoba (‘pillow words’) to add a majestic element to his poems, and of parallelism to unify his longer poems. His poetry is known for its humanity and empathy with nature. Among Hitomaro’s outstanding works are his poem on the ruined capital at Omi; his celebration of Prince Karu's journey to the plains of Aki; two poems each on the death of his first wife and on parting from his second; his lament on the death of Prince Takechi; and his poem composed on finding the body of a man on the island of Samine. The most famous poems include "In the Sea of Ivy-Cothed Iwami," "The Bay of Tsunu", and "I Loved Her Like the Leaves." "In the Sea of Ivy-Clothed Iwami"
This poem is part of a sequence which Hitomaro wrote when he was forced by the government to leave his new wife at their home by the seashore and return to the capital. The traditional way of referring to tears is speak of one's sleeves, moistened by using them to wipe the eyes. Often only the damp sleeves are mentioned and the tears must be inferred. "The Bay of Tsunu" consists of two poems, composed by Hitomaro, Lord Kakinomoto, when he had parted from his wife and come up to the capital from the province of Iwami. I wonder, will my darling catch a glimpse? "The Bay of Tsunu" was a famous poem about Hitomaro’s love for his young wife, Yosami no Otome. Hitomaro was appointed a provincial official in Iwami, which was 25 days’ journey from the capital where he had previously been working. The choka (or nagauta, "long poem"), "The Bay of Tsunu"; and the tanka or (mijikauta, "short poem") "In Iwami" were composed when he left Iwami to return to the capital, and were private laments at parting with his wife. "The Bay of Tsunu" begins with a description of a distant view of the cliffs, then focuses as if by chance on the seaweed. This change in focus introduces a change of modulation and the poem begins to speak passionately of his young wife. The "fluttering sleeves" refers to the long sleeves of the author's kimono moving as he waves farewell. After the “choka” “Bay of Tsunu,” Hitomaro composed a tanka, “In Iwami” which serves as an “envoi” (short concluding stanza, especially to a ballad). In this case, “In Iwami” reconnects Hitomaro’s passionate feelings about his wife with the wild scenery of Tsuno mountain. Hitomaro remains one of Japan's greatest, and most appealing, poets. Though Hitomaro the man existed so long ago, his poetry continues to resonate deeply with modern readers. In the Preface of the Kokin-wakashu compilation, Ki no Tsurayuki called him Uta no Hijiri, a divine poet and an equal of Yamato-era poet Yamabe no Akahito. Ikeda Munemasa wrote "Portrait of Hitomaro and His Waka Poem." The modern waka poets like Masaoka Shiki and Saito Mokichi considered him one of greatest poets in the history of Japanese literature. In Akashi, Hyogo Prefecture, there is Kakinomoto Jinja, a shrine devoted to Hitomaro. The shrine holds every year an utakai (waka party) devoted to him. ↑ Waka 0030, Thomas Mcauley, 2001. Retrieved January 10, 2008. ↑ Waka 0026, Thomas Mcauley, 2001. Retrieved January 10, 2008. Rexroth, Kenneth One Hundred Poems from the Japanese. New Directions, 1955. ISBN 0811201813. Yoshida, Kazuo. A study of Kakinomoto no Hitomaro: Some values expressed by a court poet. Kyoto Sangyo, Daigaku Sekai Mondai Kenkyujo, 1982. 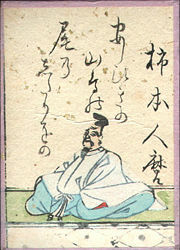 Kakinomoto no Hitomaro – Waka Poetry. This page was last modified on 10 April 2018, at 13:56.